Over the holiday weekend, while many people were enjoying time with their families and friends, I was packing and moving my belongings. Not the most exciting way to spend a weekend, but it's the first step towards an exciting/frightening future. Thankfully and ironically, my "big move" consisted of moving literally one street and a few blocks over. Which was a good thing, because my mother and I single-handedly moved all of my worldly possessions. Since I had been living with someone in their furnished house for a couple years, the majority of my items had been in an attic far out of sight and mind, and I'd forgotten how much junk I had when I lived in my own house. If I'd had more time, I probably would have tossed half of the things I ended up hauling up and down multiple flights of stairs, but I guess purging can wait until I get back into my own home later this spring. One of my favorite wacky items that I was happy to rediscover is what I call the big eyed fish. Like the leg lamp made famous in "A Christmas Story," this decorative item was a gift excitedly given to me years ago by my father when I first purchased my own home. Behold - the big eyed fish. My dad is an eccentric and interesting guy. He spotted this "beauty" while walking past an antique shop in Downtown Willoughby. 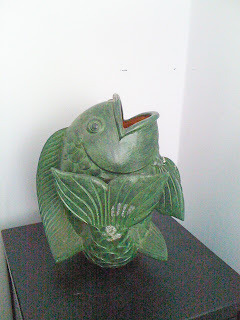 The fish "spoke to him" and told him that any 22 year old first-time home-buyer absolutely needed a stone vase in the shape of a fish. (When I'd moved into an apartment he decided that I needed binoculars to spy on people from my apartment's balcony and bongo drums to annoy the neighbors. He also got me moroccas at some point. I can't remember the meaning behind that gift.) Just like in "A Christmas Story," my dad decided that this fish needed to be prominently displayed in my home, so he placed it right on top of a tall bookcase in my dining room for everyone to see. He was so excited about the fish, I didn't have the heart to move it. So I began to enjoy the tackiness of my big eyed fish. He became a conversation piece. When I moved in with someone else, Mr. Fish was given a much less prominent position in the house. For two years he lived on top of a rarely used entertainment center in the basement. So for now, Mr. Fish will live next to the most important (and only) piece of furniture in my house - my computer desk. He can serve as a reminder of who I am and what should really be important to me.